Many people assume that chakras and auras are two different names of the same energy but that’s simply not true. They’re connected and can influence each other, but they’re not the same. There are seven chakras in our body and all of them have their own colors. The chakras have a fixed location and they don’t move. You can consider them gateways that control and direct spiritual energy. Auras are different. While chakras and energy are present inside your body, an aura is present around it. It’s like a field around your body that emits energy outward instead of channeling it inward. 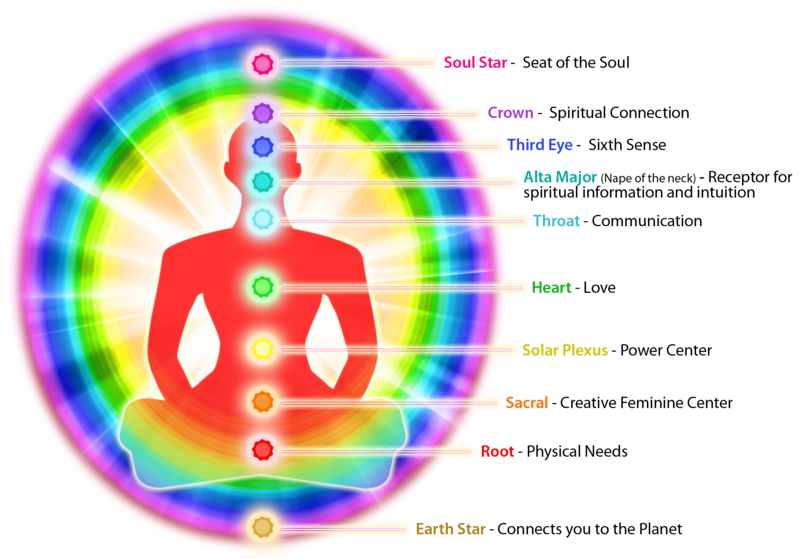 Auras always have seven layers and emit different colors that are said to reflect your personality, mood, and general health. Do Chakras and Auras Influence Each Other? Yes, they do. Your energy can’t really be fully contained. It will escape your body and influence your surroundings. While the energy within your body is controlled and directed by chakras, some of it does leak out and form an aura around us. If there’s a disturbance in the chakras, the leaked energy will corrupt your aura. If you’re surrounded by a corrupt aura, it will influence the chakras. This is a cycle that would keep going until you balance your aura. How do You Correct the Problem? Eat Well – Your food gives you energy so is it really surprising that bad food can have an impact on your chakra and aura? A healthy, home-cooked meal will help keep your aura clean and chakra balanced. We understand that it’s not always possible to eat well but if the majority of your diet is clean and healthy food, you may see a marked difference in your aura. Keep Your Environment Stress-Free – You can calm the environment of your home by burning some aromatherapy candles. You can also create a quiet room in your home where you can relax and have some time to yourself. Excessive noise might have an impact on one’s comfort and might add to your stress. Noise can also influence your chakras and auras. Meditate – Meditation is an age-old practice that has proven its effectiveness over the years. It’s very easy to learn and adapt them to your lifestyle. Just 20 minutes of meditation every day, can keep stress at bay and keep your mind healthy. It will also help stabilize your aura and chakra because it slowly corrects imbalances in your spiritual energy. There are other things like salt water baths and smudging that can help cleanse your aura. Be sure to learn what’s true about auras and what are aura myths to avoid wasting your efforts trying to heal your aura in ways that are not beneficial. If you want a more intensive treatment, we encourage you to contact a professional.